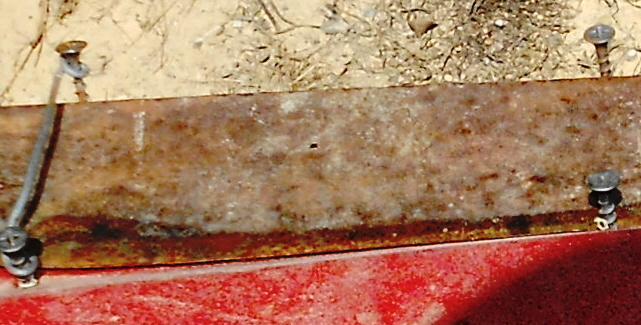 Pimp Your Lawnmower–Redneck style – Johntheplantman's stories, musings, and gardening. 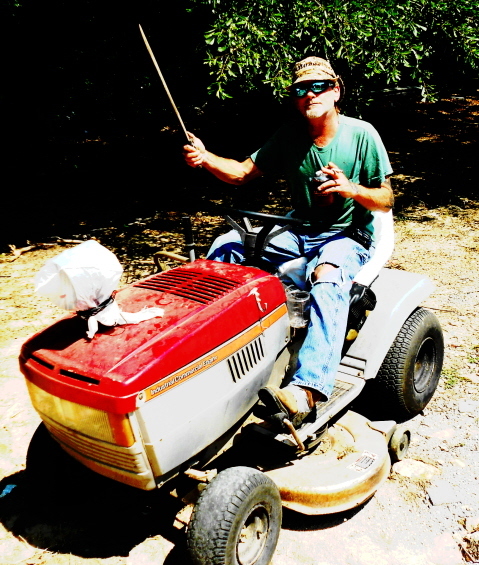 Pimp Your Lawnmower, Redneck style—-I am told that I am known as a pretty good writer of fiction and that’s why I had to get out my trusty camera for this article. I don’t think a thousand words would have told the story. Here’s what happened. I was driving down the road just past the jail, heading toward the office when the phone rang again. It was Mr. Duck. Mr. Duck lives on one side of the office and Bud lives on the other. Travis lives across the street from Mr. Duck. I call the three of them my “burglar alarms.” Nothing goes on out there that one or the other of them doesn’t see. Well, Mr. Duck was pulling in the driveway on his Massey Ferguson when I got there and we went around back to where Henry had backed into the only possible hole in the whole yard. Mr. Duck started backing his tractor up to my truck and that was when I noticed Travis, sitting over to the side on his riding lawnmower with a Natural Lite in his hand. Travis is a good guy and he had already heard about the stuck truck emergency. Travis had dropped everything but his Natural Lite, clumb on his riding mower, and rushed over to help. He got off his mower and got on his knees to hook up the chain. He had to tie the chain and on the first pull, the knot in the chain came loose. 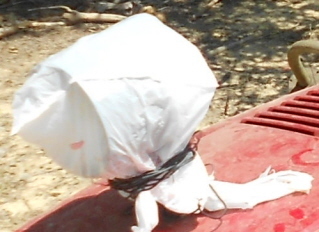 Travis tied it again, looked at me grinning and said, “Tight, ain’t it?” Then he turned toward the tractor and yelled,“Duck, how come you didn’t bring no damn hooks?” and Mr. Duck said it was an emergency and he had got in a hurry and forgot. But the truck came out of the hole just fine and the emergency was over. I gave Mr. Duck some pots of red begonias and he headed home. That’s when I really noticed Travis’ lawnmower. I quickly whispered to Henry to run real fast and get me the camera out of the truck. It was relatively to keep Travis talking while I waited for the camera. I found that he loved to talk about his lawnmower. 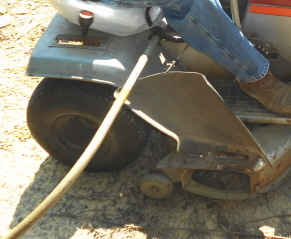 I next noticed that he had his weedeater mounted under the seat so it would be handy if he needed it. I looked at the drywall screws again, thought about it and asked, “Well, where’s the “duck tape”? 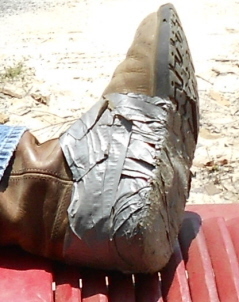 I know there’s some around here somewhere.” Travis replied that he was a firm believer in duck tape and that he was getting an extra mile out of one of his boots. He put his boot on the hood of the mower. I could tell that Travis was about ready to leave as he reached down with his left hand. 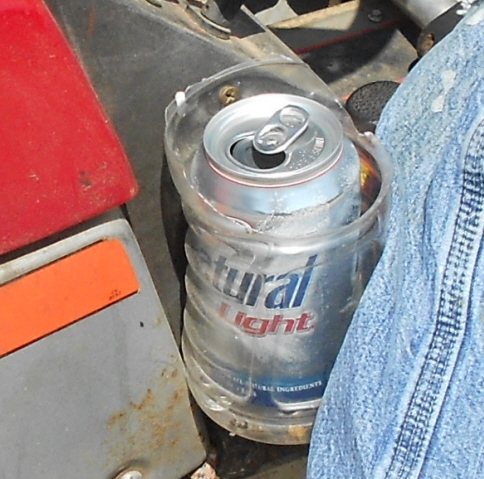 I had to look around the other side of the mower to see his cup holder (substitute “beer holder” if you like). It’s made from a cut off plastic bottle and mounted with—you guessed it—two drywall screws. I got a little closer for a more detailed look. What genius!!! I asked Travis where his beer cooler was and he said, “It’s at the house. 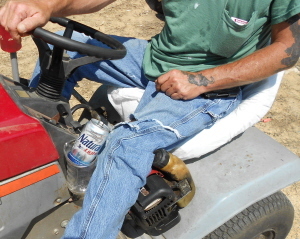 I’ll drive this here mower and drink me a beer until I’m finished with the Natchal Lite. Then it’s time for a break and I gots to get off the mower and git me another one. Johntheplantman strikes again! This here’s right funny. Nothing like being prepared for any eventuality. Travis is a good man. Yeehaw!!! Recon’ how he got that there scar on his left side? 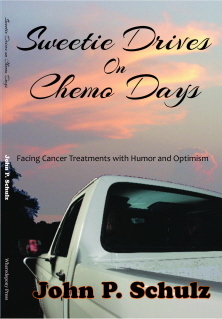 “Travis had dropped everything but his Natural Lite, clumb on his riding mower, ” clumb? I like your neighbors at your office better than your neighbors at your house. I want you to know that I get to approve or disapprove any and all comments. Your’s has been approved. Also, you have been known to hire and later “run off” some of the office neighbors. I love all of my neighbors at home and at the office. ‘Specially the German lady across the street.